BOSTON — Boston Celtics guard Jabari Bird – who also played 20 games for the MaineRed Claws last season – said he’s taking a break from the team following charges that he choked and kicked his girlfriend and prevented her from leaving his apartment. Bird, a second-round draft choice of the Celtics in 2017 out of California, signed a two-year contract with the team this summer after splitting his rookie season between Boston and the Red Claws of the G-League. He appeared in 13 regular-season games for the Celtics last season, averaging 3 points per game. 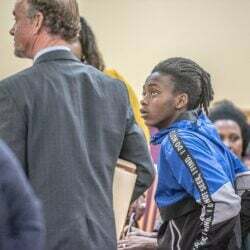 Police spoke with Bird’s girlfriend, a student at a local college, at a city hospital after his arrest , prosecutor Khyati Short said during the hearing. The ordeal, sparked by what the woman called “trust issues,” went on for several hours, she said, until Bird experienced “seizure-like” symptoms and fell. That’s when the woman left. Bird’s lawyer, former federal prosecutor Brian Kelly, said that his client “understands the seriousness of the allegations” but that there are two sides to the story. The team notes that domestic violence issues are handled by the NBA’s main office. BUCKS: A Milwaukee officer involved in the stun gun arrest of Sterling Brown has been fired because of social media posts mocking the incident, the city’s police chief said. Police Chief Alfonso Morales said the firing decision was not tied to anything Erik Andrade did when Brown was arrested, but explained that the social media posts compromised the officer’s ability to testify in other cases.